Thomas, a biology graduate now attending the College of Veterinary Medicine at Iowa State University, was matched with Mathews, a Vero Beach, Florida, veterinarian, during the spring of 2015. Mathews and her husband own and operate a small animal hospital, in addition to her pro bono work for trap/neuter/release animals. Mathews “showed that my skill set and interests aligned with vet med but maybe not in a clinical setting. When I shadowed with Sara, we were with animals and clients all day, every day.” Now in her second year of veterinary training she is leaning toward research and possibly nongovernmental organization work in an international practice. 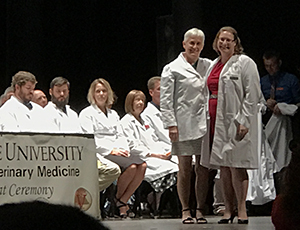 The connection forged between these two Grinnellians — both raised in Iowa, biology majors at Grinnell, and Iowa State vet students — led to Thomas asking Mathews to participate in her white coat ceremony, the rite-of-passage entry into the profession. The externship program in the Center for Careers, Life, and Service (CLS) matches current students seeking to clarify their career path with alumni in their chosen career fields. Open to all students, the externship program is primarily geared toward first- and second-year students who are still exploring majors and career options. The three-to-five day externship experiences occur during spring break and involve shadowing an alumni professional through a normal day’s activities, including a homestay. Registration for 2019 externship hosts runs through Oct. 25. Alumni interested in offering a spring break externship with homestay should contact Brooke Vonderheide, assistant director of alumni and donor relations, career programs, at 641-269-3196, vonderhe[at]grinnell[dot]edu. For general questions about the externship program, contact Stephanie Burrows, assistant director of advising and exploration, at 641-269-4940, burrowss[at]grinnell[dot]edu.